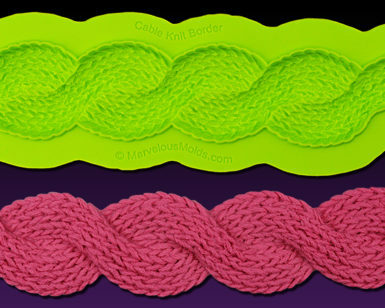 Would you believe that the idea for this stunning collection of knit molds all started with a birthday cake made for a young girl who just happened to be the daughter of Anne Heap? For those of you who don’t know Anne, she has been repeatedly recognized as one of the best cake designers in America and is known for her impressive creativity. The first thing Anne did in preparation for making the cake was to have her mother create a knitted swatch so Anne could use it to make her own molds. Anne is a great fan of Silicone Plastique which is a mold making product Chef Dominic created long ago for professional chefs and it can be found at www.MakeYourOwnMolds.com. Using Silicone Plastique, Anne made her own molds over the swatches provided by her mother and then press molded the knitted textures to create her first knit themed cake. Anne liked the results so much she approached Chef Dominic with the idea of creating a collection of molds that really explore the classic knit designs that have been a part of almost every culture on the planet for hundreds of years. 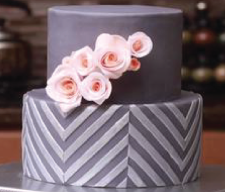 The results of this collaboration can be found in this magnificent collection of molds that are destined to become a trend setting influence in the cake decorating industry.